In this chapter, we introduce methods for solving numerically linear and nonlinear integral equations of the second kind. These methods can be subdivided into two classes: the first class consists of those methods whose approximate equations are also expressible as integral equations with the regions of integration, measures, and kernels perturbed from the corresponding quantities in the original equation. In particular, this class includes quadrature methods, e.g., Nyström methods and product integration methods. The second class constitutes projection methods which have already been introduced in Chapter 2. Examples of such methods are collocation methods and Galerkin methods. 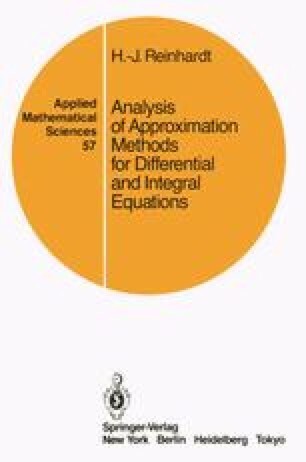 For the specific methods considered in this chapter, we derive the associated algebraic systems of equations and show how each method can be viewed as belonging to either of the two classes described above. We carry out this analysis for both linear and nonlinear problems. As preparation, we give some general results on the solvability of linear equations of the second kind and apply these to integral equations.